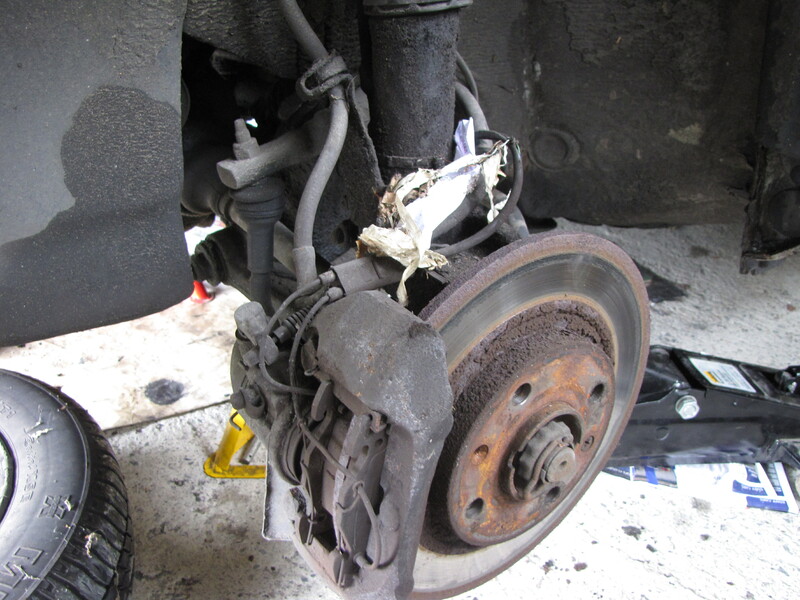 Reaching braking point – HubNut – celebrating the average! In the past 18 months, I’ve rebuilt the Mini’s front brakes, a Range Rover’s rear brakes, tried to fix a sticky caliper on a Saab 9000 and pretty much completely overhauled the Ford Maverick’s stoppers. I was hoping I could take a break from brakes, but live isn’t always fair. The problem now is the BX. One front caliper is suffering from a sticky piston, while the other suffers from a sticky handbrake cable (handbrake is on the front wheels). The two are combining beautifully to create binding brakes. Just like we had on the Mini, Range Rover, Saab and Ford. What is it with bloomin’ brakes?! My mood isn’t enhanced – though it probably should be – by the 2CV just sitting there looking smug. In almost 100,000 miles of motoring, and 12 years of ownership, the 2Cv has needed one set of front discs, a couple of sets of pads, a pair of new rear shoes and that’s about it. No binding issues at all, thanks apparently to the use of alloy pistons. The problem with the others? Steel pistons. What a rubbish idea! Being steel, they inevitably corrode and then seize. The other issue is that the brakes on these cars all sit in the wheels, so get covered in road muck. The 2CV wears its front brakes on the sides of the gearbox, in the engine bay, and further away from wheel-hurled muck. Whoever was in charge of 2CV brakes deserves a medal. Especially as they’re so powerful as well! I’ve now got the decision with the BX about whether to rebuild the front caliper or just buy a replacement (as I did on the Maverick). £40 for a complete caliper, but not sure how much a rebuild kit would be. Probably a fair bit as the piston is gunked up enough to need replacing. Hopefully pay day will allow me the luxury of the expensive option! In the meantime, yet another hero on the BX forum is sending me another handbrake cable, so I can sure that issue pretty easily. I hope that this will bring an end to brake-fettling for some considerable time. I can dream can’t I?